A delicious fish dish that's full of flavour. Oil a baking tray and put the whole fish on it. Stuff the cavity of each fish with the lemon slices and fresh herbs and season well, then drizzle over a little olive oil. 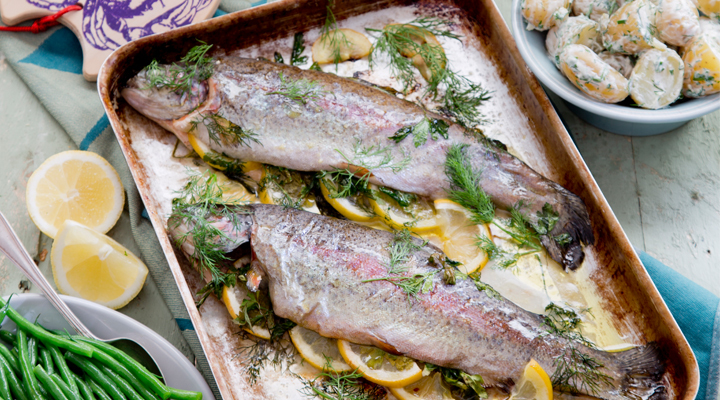 Cook in the oven for 20 to 25 minutes, depending on the size of the fish. Meanwhile, steam or boil the baby potatoes until a sharp knife pierces the potatoes easily. Drain and allow to cool a little, then tumble into a large bowl. Gently fold in the crème fraîche, gherkins, fresh herbs, salt and a generous amount of black pepper, trying not to break up the potatoes. Serve the fish with the warm baby potato salad and green beans on the side.